"A "chiral" molecule is one that is not superimposable with its mirror image. 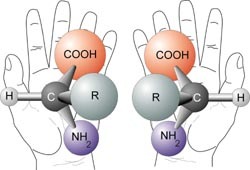 Like left and right hands that have a thumb, fingers in the same order, but are mirror images and not the same, chiral molecules have the same things attached in the same order, but are mirror images and not the same. Although most amino acids can exist in both left and right handed forms, Life on Earth is made of left handed amino acids, almost exlusively. No one knows why this is the case. However, Drs. John Cronin and Sandra Pizzarello have shown that some of the amino acids that fall to earth from space are more left than right. Thus, the fact that we are made of L amino acids may be because of amino acids from space. Why do amino acids in space favor L? No one really knows, but it is known that radiation can also exist in left and right handed forms. So, there is a theory called the Bonner hypothesis, that proposes that left handed radiation in space (from a rotating neutron star for example) could lead to left handed amino acids in space, which would explain the left handed amino acids in meteorites. This is still speculative but our paper makes it much more plausible. In fact, this observations was one of the main reasons why we persued this research. Although there were theories about how the amino acids could form in space in the ice, no one had shown that it was viable to make amino acids this way, until now." This file is public domain because it was originally published by NASA.